This pedal was developed for high gain applications and specifically for clarity at heavy distortion levels. The Stone Grey Distortion is unique in that it has razor sharp dynamics and high gain intensity. It’s ready for drop tuning, 7 string, and modern rock players who are seeking extreme gain with intense “string to string definition”. Play a chord and hear each note distinctly, instead of it turning to “mush” like many other high gain pedals. 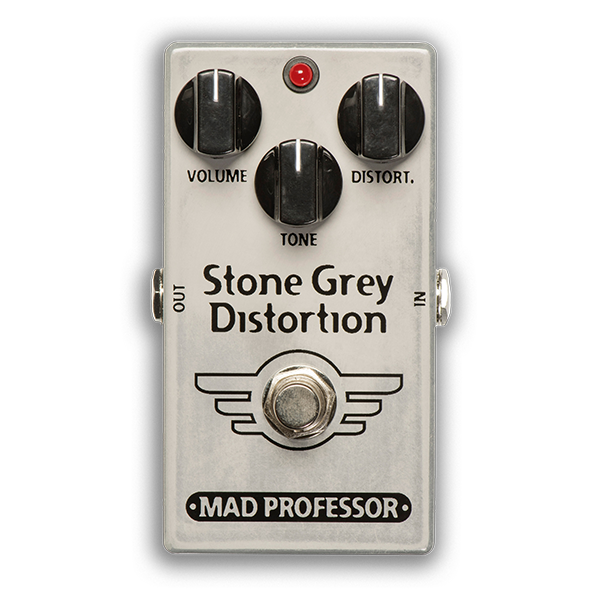 With the gain turned down, the Stone Grey Distortion approaches overdrive-like textures and responds to the player’s touch and dynamics like our other Mad Professor pedals do. CONTROLS VOLUME: Sets the output level of the distorted signal. TONE:: This is a boost/cut “shelving” type equalizer that controls the amount of high-end, operating somewhere between a bright switch and the treble control on most amplifiers. DISTORTION: Sets the level of distortion. – lower levels more overdrive-like textures – higher with heavier distortion. CAUTION: Never operate the unit with its bottom removed or damage will most likely occur. ELECTRICAL SPESIFICATION Current consumption: 8mA at 9VDC Voltage supply range: 7,5-15 V Input impedance: approximately 500K Recommended Output load: 50K or higher Complete bypass (true bypass) and input of circuit grounded when in bypass. POWER REQUIREMENTS: 6F22 9V battery or DC eliminator 2.1 mm plug center/negative and positive/sleeve.